I have always known about plea bargaining and that many US citizens, defense lawyers, and criminal rights activists disagree with it, but have never known why. This project offered me the opportunity to not only learn more about this controversial legal issue, but also better understand the other side’s perspective. I am passionate about this issue because during this century more than ever the United States’ prison population has exploded. Through school readings and the news I have grown concerned over the innocence of many of these convicted criminals. I have become convinced that more reform must be done to improve the American justice system. Through this presentation I hoped to present an issue in criminal cases that may inspire others like me to take a stand. 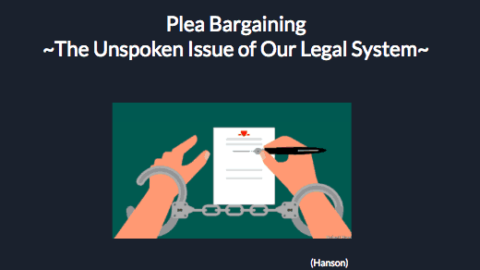 Plea Bargaining: The Unspoken Issue of Our Legal System by Jacqueline is licensed under a Creative Commons Attribution-ShareAlike 4.0 International License.